One of my favorite meeting programs is when we have Demo Days. 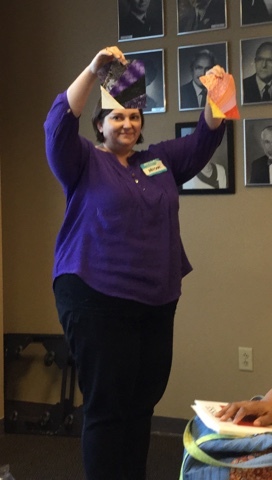 This is when our members demonstrate their skills and we rotate in a round robin fashion so we all get to see all the presentations. 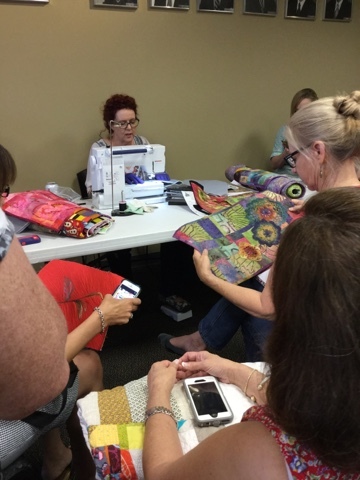 This month's demonstrations were on free motion quilting. 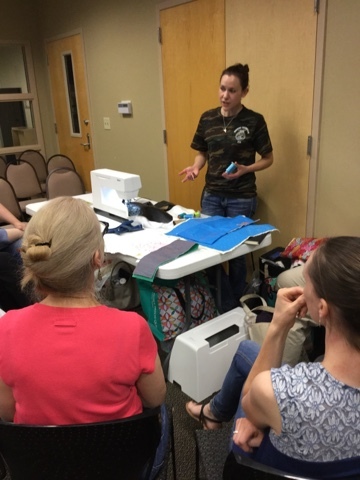 Kelly, Leslie and Joanna all gave great demonstrations of what they do with tips and tricks of the best supplies, materials, practice methods and tools to help you. But the overwhelming message was "You can do this!" "Just give it a try." 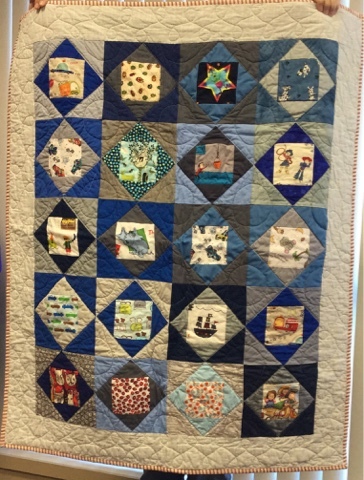 All recommended making up small quilt sandwiches and having them ready by your machine so when you have a few spare minutes, you can play. They all agreed that the more you did it the better you got. Joanna even recommended carrying a journal around so you could play around with pen and paper when you weren't at home but had some free time. It was also recommended to use high contrast thread as you practice, so you could easily see how things were going. 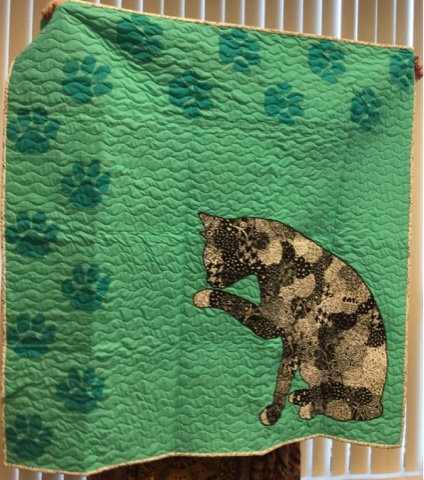 Some advice I received in the past from another quilting friend was to cut those sandwiches the size of placemats and that way you'll have a use for your practice pieces when you're done. And you won't be too upset when the kids or grands leave stains behind. We had some special treats at the June meeting. But first, here's some of the announcements for those who couldn't make it. 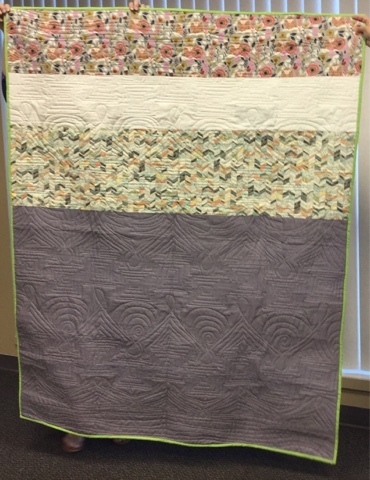 Thursday, June 11, a new Modern Quilt Guild webinar will be released: Quilt Show Judging and Jurying Panel. 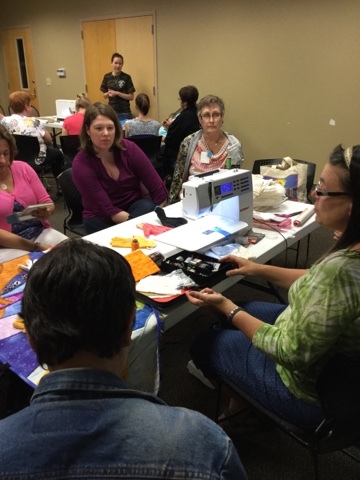 You'll be able to get insider tips from quilt experts and former judges: Jacquie Gering, Shannon Page, Stevil Graves and Heather Grant. They'll discuss jurying, shipping, photos, scoring, and the dos and don'ts of submitting your work. You should have received an email with a link to register. If you didn't, you might want to check out your membership. You're missing out on all kinds of things if you haven't activated it yet. 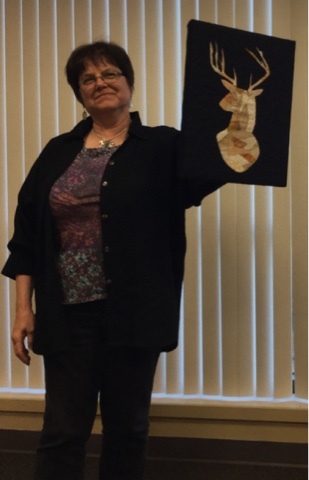 You should have also received the announcement that the QUILTCON West (Feb 2016) Catalog is now available. Early registration starts June 25 for members. The Keynote Speaker will be Gwen Marston. 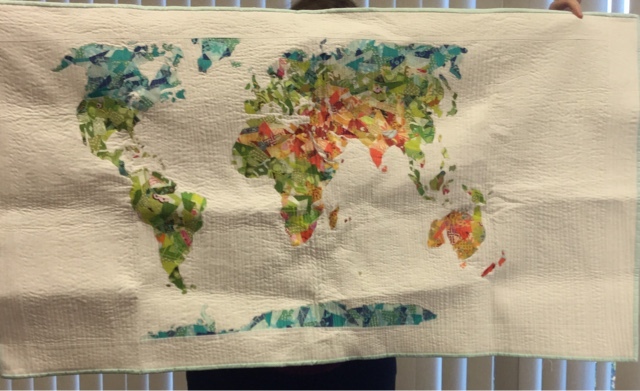 The International Quilt Festival will once again host a special exhibit of works from Modern Quilt Guild members to premiere at this year's show in Houston... and ALL worldwide MQG members are invited to participate! 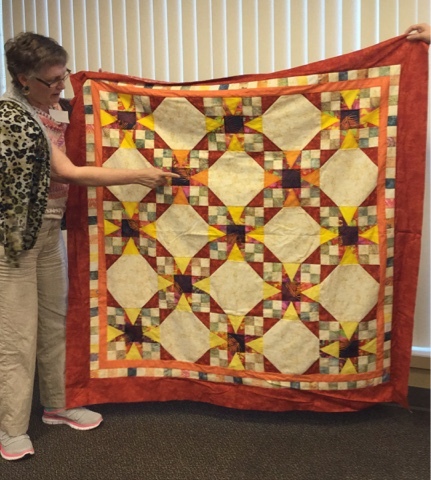 Members may submit up to two quilts for consideration. 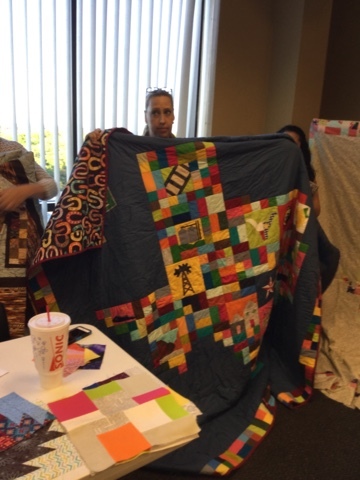 All quilts must be at least 36" on each side (no maximum width/height). And completed submissions with visuals must be received online by July 1, 2015. 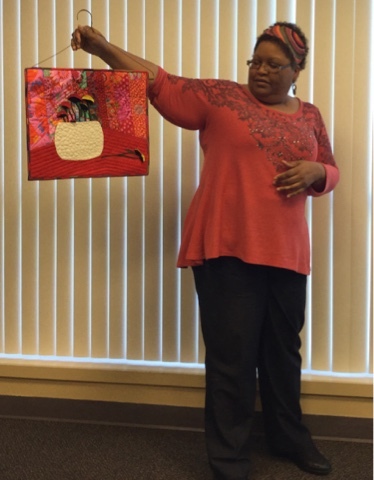 The Michael Miller Glitz Fabric Challenge is also available for participation. 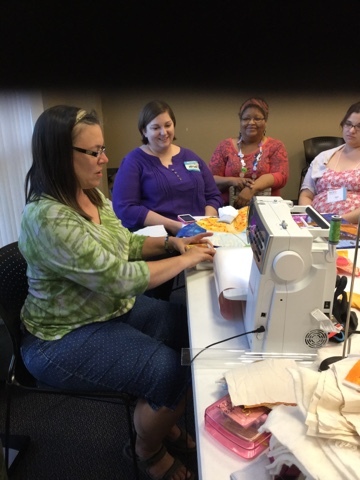 All fabric will be shipped by mid-July, and the deadline for entries is November 30, 2015. 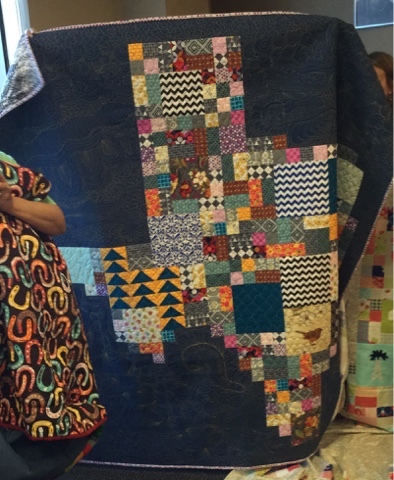 Your quilt will be entered it into the Michael Miller Fabric Challenge category at QuiltCon West 2016. The top prize for this category is $1,000. If you didn't get in on the free fabric you can still participate. And don't forget our very own President's Challenge deadline is the September guild meeting. That one if just for fun. We had a reminder about our next meeting. Different date AND different location from our normal guild meetings. The room seats 75 so you can bring friends to see the presentation by Victoria Findlay Wolfe, but guests will be charged $5.00. 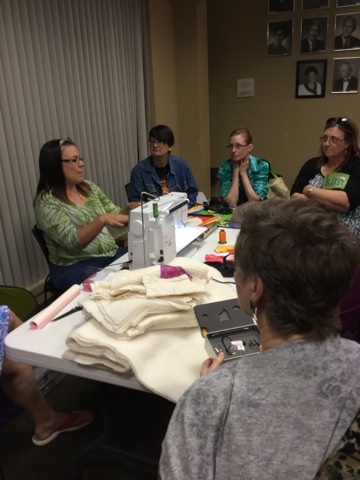 Meeting will be on July 9 at 7 (6:30 sewcial time) at the Episcopal Diocese of West Texas, 111 Torcido Drive (near Broadway and Patterson behind Central Market). Workshops are the following Friday and Saturday. 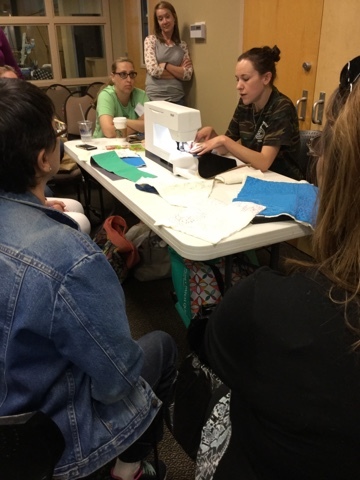 One slot is still left for Saturday's VFW workshop. Let Leslie know if you're interested. 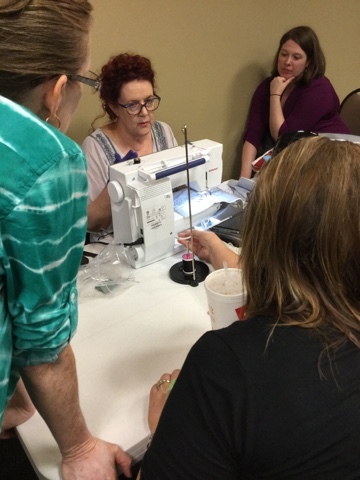 The next retreat was announced for August 28-30 at Kerrville's Main House, right next to Creations. This is a great way to get to know some of the other guild members a bit better and get some UFOs taken care of. To reserve your slot, the deposit is $35 with the balance $165 due at the August meeting. 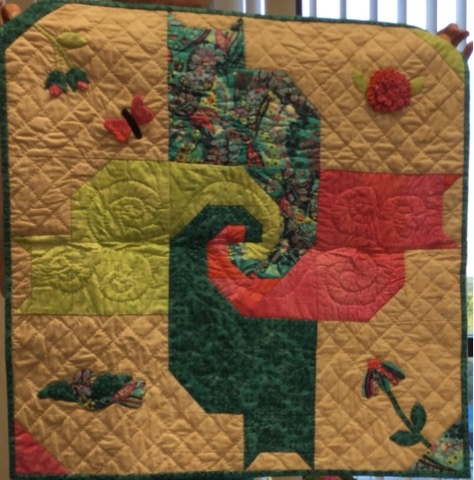 One of the special presentations from the meeting was from Eileen, Beekeeper for the Journey to Modern Art Quilting Bee. 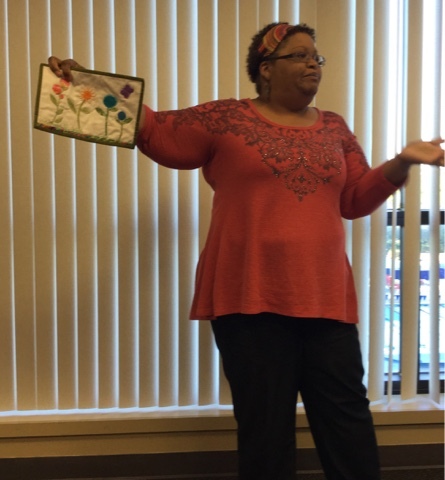 She showed us some of what the group has been doing and invited everyone in the guild to join in. Their next meetup will be June 13 at Kathy's house where they'll be working on Snazzy Self Portraits. They are constantly challenging themselves to try something new, and if you'd like to try something new yourself, come join them. 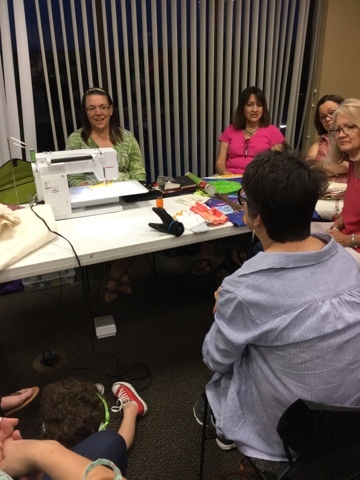 Let Eileen know you're interested and she'll add you to their FB group so you can get information about all their meetups. Check out the pics below. 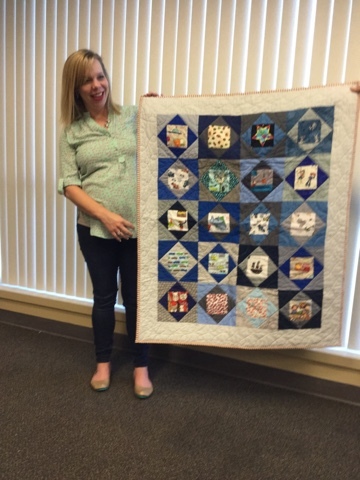 The Journey Bee members made this quilt to benefit blind children's programs. 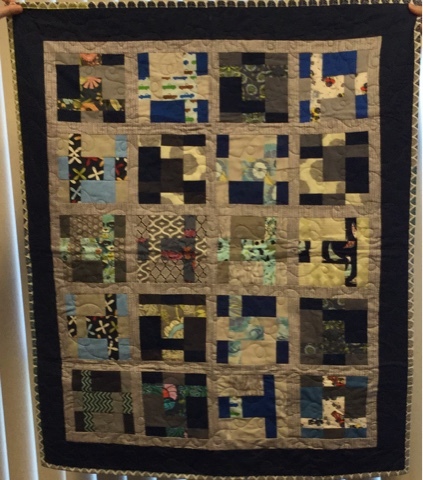 This quilt will be part of the "blind" fundraising auction for the San Antonio Lighthouse for the Blind 5th Annual Art in Dark event held Thursday, June 18th from 6:30 -9:00 p.m. at The Do Seum, San Antonio's new children's museum. Go here for more info. 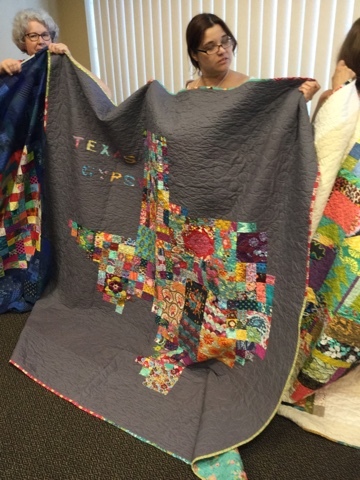 A group of our members did a local Deep in the Heart of Texas Road Trip Quilt Along and those who finished brought in their quilts. 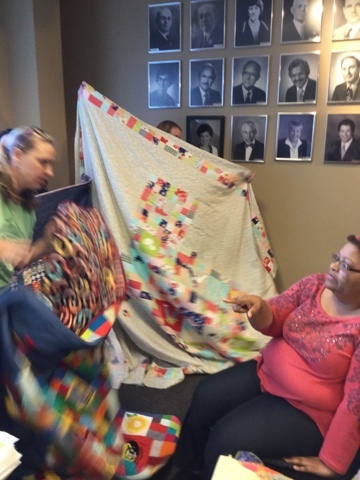 It was so fun, the group is considering another quilt along in the near future. Sorry my pics didn't work out as expected, but here's some of the beauties. Some participants donated prizes that were drawn as each quarter was completed and prizes were also donated for those who finished. Winners included Joy, Reagan, Debra, Edna, Allison, and Jessie (by random drawing). 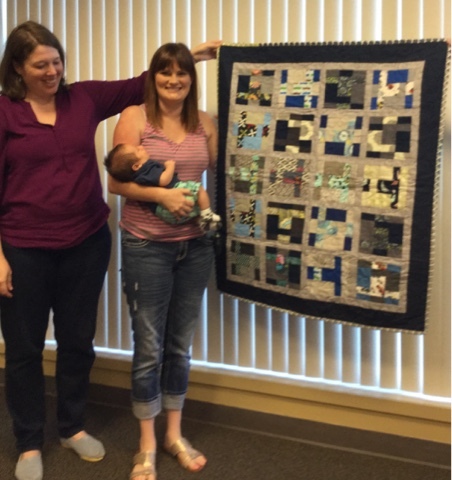 Another thing you missed was the presentation of two baby quilts made for our members by our members. Both moms look pretty happy, see below. We didn't have much participation in the last two Blocks of the Month. May's Scrappy Majesties didn't have any entries, so Susan took hers home. 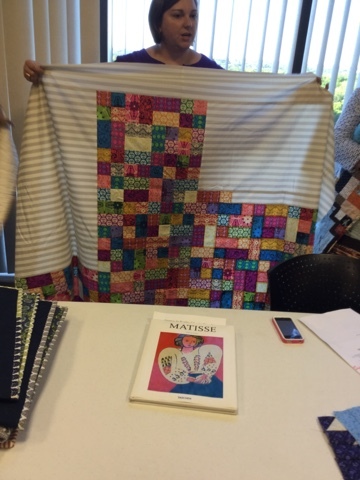 Kathy was the only one who brought in June blocks, so she took hers home. Sorry it happened fast, and I didn't grab pictures. 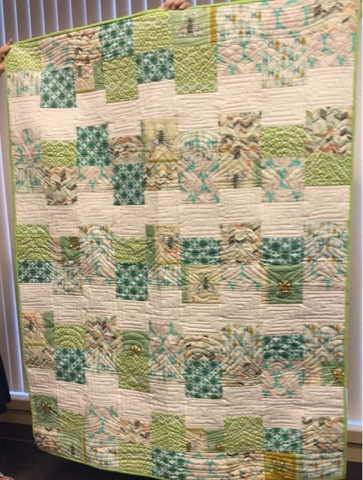 Below are the blocks for the July Block of the Month. Check on FB for instructions. This one is a bit smaller so hopefully we'll have some more participants. We talked about some other charity initiatives. 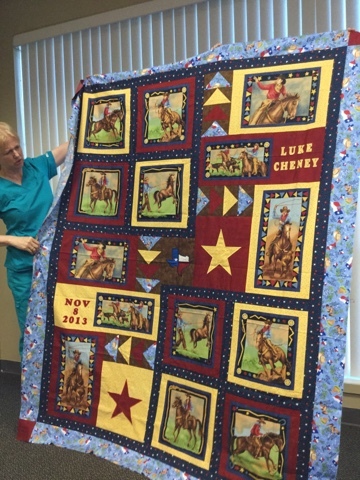 The board had added money to the budget to pay for shipping and help support the QuiltCon Charity Challenge. A motion was made, seconded and members were in favor of using that money to support the Barnabas Connection, a non-profit organization that is providing support to the flood victims of our neighbors in Wimberley. 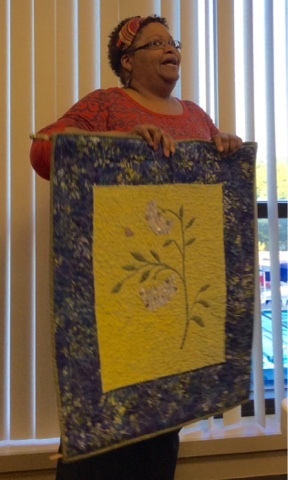 We'll use donated fabric to participate in the QuiltCon West Charity Challenge. We'll get more info about that later. 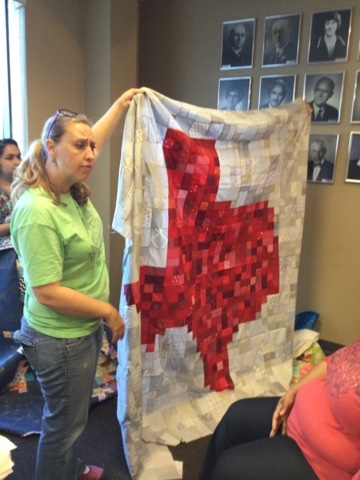 Another charity effort was mentioned for those who want to help Texas flood victims through #floodtexaswithlove. 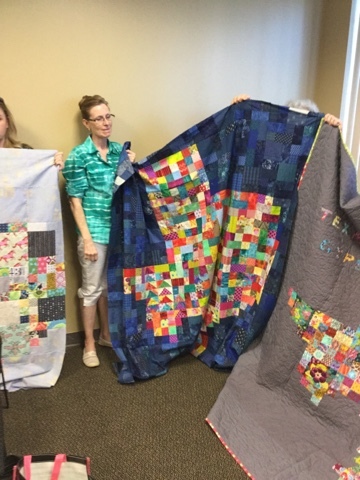 If you would like to make an improv quilt block for victims of the recent Texas floods, Sara Stetson from Austin is collecting these blocks. Deadline is June 30th and more details are here. 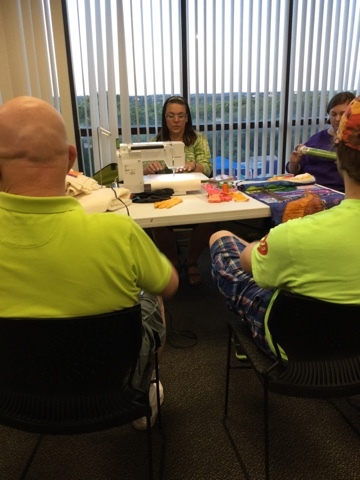 And one of the meeting favorites was the Sew-n-Tell. 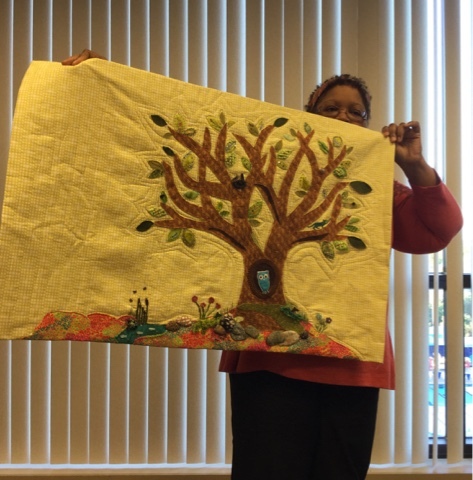 Members were reminded that this was for modern quilts only (even though we all may love quilts of all genres). 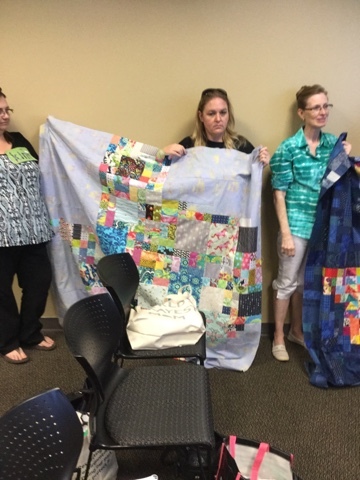 It was also suggested if you want to show your non-Modern quilts off to your fellow members that you could bring them to the sewcial hour that precedes every meeting. See below for this month's eye candy. 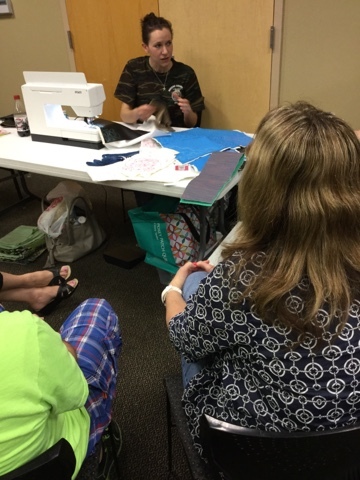 The program for the June Meeting was a Demo-Day. I'll post more about that in a separate post. Sorry if you had to miss this meeting. Hope we see you in July.